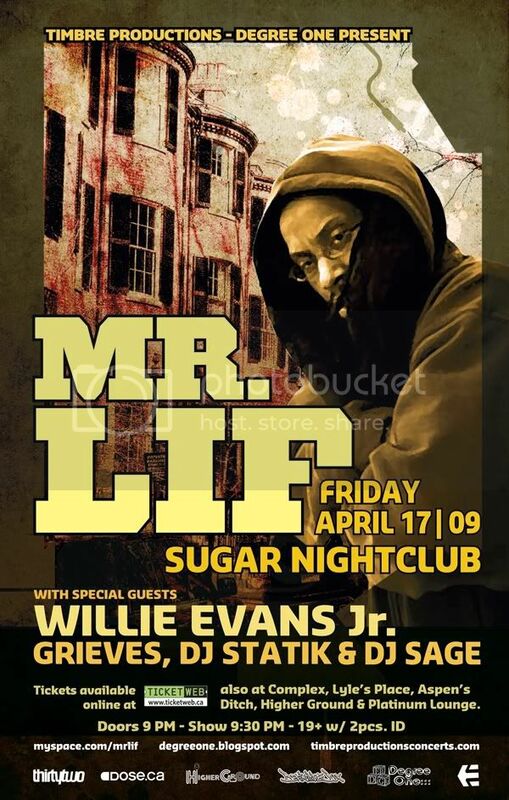 Degree One Events: MR. LIF... Live @ Sugar in Victoria. MR. LIF... Live @ Sugar in Victoria. Willie Evans Jr., Grieves, DJ Statik and DJ Sage. "Mr. Lif has become perhaps the most touted lyricist in Boston Hip-Hop history" (Boston Phoenix 12/1/00). Since his 1997 debut on Brick Records Rebel Alliance LP, Mr. Lif has released numerous singles, an EP and a live album to international critical acclaim. 1998's "Elektro," and 1999's "Triangular Warfare," which featured B-side production from underground kingpin El-P (then of Company Flow), introduced the world to Lif's infectious delivery and distinct voice. In the Fall of 1999 Lif hooked up with the Beastie Boy's Grand Royal Records for the release of his third single "Farmhand" as part of the 12" series Blow up Factor. The year 2000 marked the release of Lif's first EP 'Enters the Colossus' on Definitive Jux Records, prefaced by the lead single "Front on This." Mr. Lif also did what few hip-hop artists have ever tried to do, he released a live album. 'Live at the Middle East' brings to life Mr. Lif's incredible energy and ability, as he performs all the classics, plus introduced three new songs to the masses. His ambitious work continued in 2002 with a pair of concept releases. The 'Emergency Rations EP' bookended collaborations with Edan and Akrobatik in an MC abduction scenario, while the 'I Phantom' full-length formed a saga that led him from birth to apocalypse. The seven-song EP 'Emergency Rations' offers in-depth commentary of the ills of the American society post 9/11. In a voice reminiscent of political giants like Public Enemy, Mr. Lif calls America's foreign policy into question, and examines with a critical eye the War on Terrorism. In an era of increasing censorship and violation of civil liberties, Lif speaks for the unheard masses. Mr. Lif's debut full-length effort, 'I Phantom', was released on September 3rd 2002 on Definitive Jux Records. Lif and long-time friend and legendary beatsmith El-P (founder of Definitive Jux Records) teamed up for six incredible tracks on the album, with production by Lif, Fakts One, Insight and Edan round out the rest of the album. I Phantom features guest shots from Jean Grae, El-P, Aesop Rock, Akrobatik, Insight, Edan and more. He revisited his Akrobatik collaboration in 2005, when the pair joined producer Fakts One to form the Perceptionists, who released Black Dialogue, also on Definitive Jux. One year later, he returned with 'Mo' Mega', his follow-up to 'I Phantom', featuring eight productions from El-P and features from Murs, Aesop Rock, and Blueprint. Politically charged Mr. Lif is getting ready to release his third solo album, 'I Heard It Today' on his own label Bloodbot Tactical Enterprises. The album will be released April 21, 2009 and is likely influenced by Mr. Lif’s near brush with death when his tour bus overturned in 2006. While touring to support “Mo’ Mega”, Lif’s tour bus driver fell asleep at the wheel, causing the bus to swerve off the road and drop 40 feet into a boulder laden ravine. Lif claims that “the injuries I sustained that night and the adversity I’ve faced in the years following have increased my strength immeasurably”. 'I Heard It Today' reflects this increased strength, displaying a determination, focus, & conviction destined to shine in these tumultuous times. Four-time Boston Music Awards winner, Mr. Lif has toured the world, performing alongside the very best in Hip-Hop and beyond, including; Eminem, The Roots, Company Flow, Busta Rymes, Burning Spear, Souls of Mischief, Cannibal Ox, KRS-One, Mos Def and Talib Kweli, Roni Size Reprazent, Tortoise, Zap Mama and many, many more. As a lyricist, Mr. Lif offers Hip-Hop through the eyes of an intelligent man who is passionate about his art form. He commands the attention of his peers and seeks to inspire them to search for Knowledge of Self. Within one song, he may launch an attack on the American educational system while delivering an onslaught of battle rhymes that will make Hip Hop fans reminiscent of park jams back in '88. Mr. Lif uses a powerful command of vocabulary to create vast and precise images. Listeners receive an intense lyrical package that contains highly visual content delivered via polyrhythmic flows, a voice full of character and authority, as well as a compelling sincerity that will blow your mind.